The word is out—the cheapest way to get from one major U.S. city to another is on the “Chinatown bus”. In recent years this has become transportation option of choice for budget travelers in New York, Washington DC, and Boston, and more recently on the West Coast. Students, backpackers, and an array of other savvy travelers have long loved the rock bottom prices that these bus companies offer. Despite the popularity of these bus lines it can still be difficult to find information on Chinatown bus service. What exactly is a “Chinatown Bus”? Read on and you will have the inside track on this great budget travel option. The Chinatown bus phenomenon began in the late 1990s when an entrepreneur in New York’s Chinatown started running daily bus service from Chinatown in New York to Chinatown in Boston. The service was aimed at Asian immigrants who wanted to shop or visit relatives in either city and needed cheap and convenient transportation. The service was bare bones—no advertising, customer service, or bus stations. Customers simply went to the bus stop, waited for the bus (or van), and paid the driver upon boarding. For those willing to do without frills, they offered virtually the same service as traditional bus companies at a substantially lower price. Before long, the word spread and all kinds of people started using the service. It became especially popular with students, budget travelers, or people for whom the service was simply more convenient. Soon more bus companies duplicated this model and started offering service in other cities. Now you can find this type of bus service in Philadelphia, Virginia, Baltimore Washington DC, Los Angeles, Las Vegas and San Francisco. At this point the term “Chinatown bus” is used more loosely to describe this sort of low-cost/low-frills service. Many, if not most, of the companies do not have Chinatown as their main location and may not cater to the immigrant population at all. These operators are also sometimes referred to as “curbside” operators. $15 between New York to Boston? $25 from Las Vegas to Los Angeles? It seems hard to fathom. Chinatown bus companies are able to keep prices low because they operate in a fundamentally different way from traditional carriers. Foremost, the service is very basic. There is little in the way of customer service or amenities. Most of these operators do not have formal stations, picking up passengers at bus stops instead. They eschew traditional advertising in favor of word of mouth. Further, many of the operators play a very hands-on role in the operation—you will not see idle executives at a small independent bus company. Finally, these operators make sure they fill their buses. That is why Chinatown bus operators usually only operate on heavily trafficked routes. Indeed some companies only run buses at peak times. When these companies first started operating, concerns were raised about safety standards. There is still controversy within the bus industry about whether these newcomers are complying with the same regulations as the traditional companies. However, a task force set up by the Federal government to look at safety issues found that Chinatown bus companies did not perform better or worse than other types of bus companies (ie. charter, tour buses). All bus companies operating in the U.S. must undergo the same inspection standards and must comply with the same rules. Realistically there is probably a range of quality among Chinatown bus carriers. Some are fly-by-night operators trying to make a fast buck, while others are legitimate entrepreneurs who plan to grow and operate a long term business. &#61664; No frills service—the driver may be the ticket collector; there will not be a lot of customer service. &#61664; Comfortable buses. Despite the low fares buses are usually quite nice. 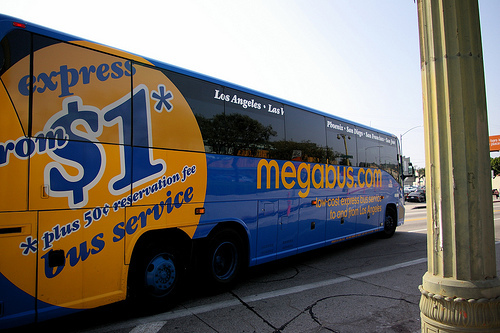 Most buses are comparable to Greyhound and many are actually more deluxe. &#61664; Communication challenges. Drivers are legally required to speak enough English to help passengers in the case of emergency. In reality this is often adhered to rather loosely. At the very least, expect your driver to have an accent. &#61664; Possible delays. Many of these bus routes are on highly congested roads. When the roads are busy, expect delays. &#61664; Rest stops. Buses will have a lavatory on board but there is usually a 10 or 15 minute bathroom break on trips over 4 hours. Don’t be late returning to the bus, the driver will not count heads before leaving at the appointed time. &#61664; Full buses. Buses definitely sell out at peak times (weekends and evenings). Book ahead or get there early if you want secure a seat. &#61664; Plastic Bags. An odd little quirk on Chinatown buses is that every aisle seat usually has a plastic grocery bag tied to the arm. I guess they find this is the best way to keep the buses clean. Again, “Chinatown bus” is a term used to describe a type of operator and not an individual bus company. Many unrelated bus companies fall into this category. Since most Chinatown buses do not spend money on advertising it can be difficult to find out details about schedules and bus stop locations. Many of the carriers are becoming savvier about the Internet and quite a few have websites with information. Usually an Internet search will yield links to bus service to your destination. There are also several directories, such as chinatown-bus.org that include links for most Chinatown bus companies and the author’s employer, GotoBus.com, is a centralized booking site that has schedules and sells tickets online for most Chinatown bus companies. The Chinatown bus is not for everyone. If you want an orderly system with American style customer service, you should probably stick to traditional carriers. However, if you know what to expect and come prepared with a sense of adventure and humor, you should enjoy the trip just fine. You will also enjoy the money you save!